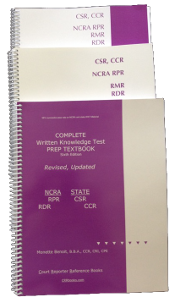 Must-Have Test Prep for NCRA’s RPR, RDR, and State CSR Written Tests = DIO = Done In One. OTO = Only Test Once. Study The Purple Books To Pass The First Time! 98% successful pass rate. Books: Time-Tested And Proven. Online testimonials from students, court reporters, and CART Captioners. Pedagogically sound covering a wealth of material with facts, tips, and information. CRR Books has been assisting individuals and test candidates to advance skills since 1990. DIO = Done In One. OTO = Only Test Once. 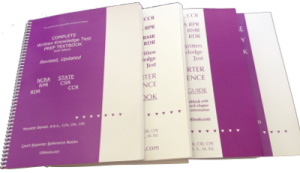 Study The Purple Books To Pass The RPR, RDR, and CSR The First Time! Books, CDs, tutoring with the Court Reporting Whisperer, free articles to advance skills for national and state test prep certification material, real-time writing, captioning, CATapult software, dictionary building, and vocabulary preparation. Get ‘Er Done On The First One. ** “One-and-Done Pass” With The Purple Books. and Motivational Steps Forward … to your Goals … Now … Today! The Complete NCRA and State Written Knowledge Test Prep Textbook, Sixth Edition, is Ready! Are you? A must-have test prep for Students, Court Reporting Schools, and Court Reporters studying for their State CSR and NCRA RPR, RDR certification. Experienced or novice court reporters, students, schools, CART Captioners, judicial and freelance reporters, and real-time writers will improve and advance credentials effectively and in less time. Private tutoring and coaching for students, court reporters, CART Captioners, and professionals. … And much more to help you create your success TODAY! The information is presented in formats to specifically maximize your retention and impart more confident and successful test-taking ability. 98% first-time successful pass rate on test prep for the NCRA RPR, RDR, and State CSR court reporting written exams. #1 Test Prep (more below) “The Full Set” consists of 4 books; The”Trio Test Prep” consists of 3 books. Now, you have more choices! Get the latest fast tips, advice and articles from Monette Benoit on a monthly basis. Just click here for a no-obligation subscription for fast and effective tips, advice, and updates. Are you taking the NCRA RPR, RDR certification or a State CSR, court reporting exam? Do you know someone who is? NCRA and State Test Prep: Now, our material covers even more than previous NCRA, National Court Reporters Association, and State CSR court reporting certification questions. This is the only textbook –Recently Updated and Revised– to help individuals pass court reporting training certifications – NCRA RPR, RDR, and State CSR court reporting examinations. Learn THE method to taking a test and save huge chunks of time. Learn about Written Knowledge Tests (NCRA WKT and state exams) and the distracting answer. Study necessary ‘areas of knowledge’ you will be tested on. Learn how to answer questions by studying the foundation of information for NCRA RPR, RDR, and State CSR, CCR court reporting examinations. If you’re struggling or simply want to accelerate your career’s progress, court reporting veteran Monette Benoit can help you achieve your goals. If you are a home-study student, enrolled in a court reporting program, or an experienced professional, Monette Benoit can help you achieve at much higher levels. Where do you want to go? What have you really wanted to do with your career and, ultimately, your life? • Analyzing what’s working and what’s not working. • Process learning skills for more effective retention, and Career Counseling. She has also helped create new court reporting training programs, worked with federal grants, and assisted instructors in developing curriculum for both in-class and at-home students. ** Students receive a discount. “Although I attend a court reporting school, I was not comfortable that the vocabulary and speed-building process being taught would move me to graduating speeds in an acceptable timeframe. As my tutor, Monette Benoit is very knowledgeable in all areas of court reporting and very quickly assessed my current study habits and practicing techniques. She offered suggestions that started helping me that same day! The CATapult Dictionary Building Software Program is the industry’s leading court reporting realtime dictionary builder, improving real-time writing and speed enhancement. Build, expand and enhance your professional real-time dictionary as thousands of progressionals now working as experienced broadcast captioners, CART providers, and court reporters have done. Each ‘CATapult’ TM CD program is not a one-trick pony; dictionary building is only one feature. CATapult CD series has multiple uses, features and applications for captioners, court reporters and students. Further, the entire CATapultTM CD Series is supported by CATapult’s programmer, Robert W. McCormick, Ph.D., MBA, CRI, 2004 NCRA Teacher of The Year, Award of Excellence. “I’ve had a long history in training captioners, and it is my belief that the strongest captioners are those who are strong writers. Seems simplistic, I know, but the reason that they’re strong writers is not because they’ve got perfect fingers on perfect hands. The reason that they’re strong writers is because they can process information at a very rapid pace. And they can process information quickly because they ‘know’ what they’re writing. You can’t write well what you don’t know and what you don’t understand. In the end, it’s all about words, but you’ve got to know the words and the subjects. If you’re expected to do more with less, on the job, in court or in a classroom, Monette wants to help you today. Monette Benoit, B. B.A., CCR, CRI, CPE, is a columnist as contributing editor for NCRA’s (National Court Reporters Association) Journal of Court Reporting. Her column “Beyond The Comfort Zone” is published each month. Since 1995, Monette has authored approximately 190 articles for the National Court Reporters Association, JCR. A sampling of her articles are listed under Latest News, per your requests. Currently, her blog, Monette’s Musings, currently has many more articles than included on this site. She has worked with professionals, educators, reporters, and programmers to create user-friendly interactive CDs, a textbook, workbooks, study guides, handbooks, and dictation material to assist individuals to master their work and to pursue the creation of new goals. Monette’s services, products, educational books, tutoring and coaching, public speaking — plus interactive CDs containing ten volumes within the ‘CATapult’ CD Series are recognized in 17 countries. A donation is shared for each ‘CATapult Your Real-Time Dictionary’ CD purchase through CRR Books And CDs with The National Breast Cancer Organization, www.nationalbreastcancer.org. Each August 5th, Monette Benoit publishes an update to Captain Kevin Drue Donnelly, activist, advocate, researcher. Veterans and family members frequently have been walking alone without accurate information on hepatitis C. Now we seek to define where we are headed. The CDC, Centers for Disease Control, currently posts a number of over five million adults and children within the U.S.A. who have contracted the hepatitis C virus. Researchers have concluded four times as many people will die from hep C than AIDS within the next decade, as the hepatitis virus continues to spread and piggy-back AIDS. WHO, World Health Organization, posts an international number of over 170 million people with the hepatitis virus. ** This hepatitis C posted 5-plus million CDC number does not include veterans who have served their country; neither does this number include individuals in the military, prisons, homeless populations or individuals outside U.S.A. borders. Currently, the CDC does not include their numbers with published information. Monette’s brother wrote “The Panama Story” to assist individuals, veterans and their families to learn about hepatitis C. After Kevin’s diagnosis, he wrote one chapter each evening as he worked to assist veterans, their families and to conduct research based on facts. Just as a mother teaches a child to look both ways before crossing the road, we can teach, we can share, we must. Since 1990 ‘CRR Books And CDs’ has created extensive customized NCRA test prep materials and tutoring, coaching with the Court Reporting Whisperer for students, court reporters, captioners, CART providers, and teachers accelerating skills, earning NCRA written test and state certifications – plus – CATapult Your Dictionary offers students, court reporters and captioners interactive, realtime dictionary building CDs, which contain free features.